These sort of errors on Recycle Bin indicated Bin corruption. Such errors doesn’t allow you to delete any file or folder on your computer, Recycle Bin may not show your deleted files or you may fail to empty Bin. You need to deal with it in a proper way to make the Bin function normally. 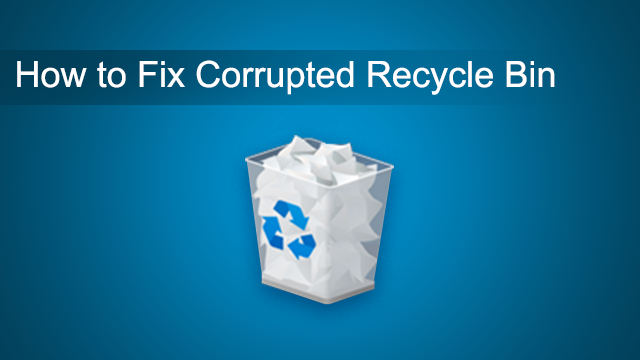 Here we will give details on reasons for Recycle Bin corruption and easy troubleshooting methods to fix it. How Did Recycle Bin Get Corrupted? There are various reasons due to which your Recycle Bin gets corrupted. Out of all, few common causes are listed here. How to Fix Corrupted Recycle Bin? Note: Repeat the last step by replacing C with rest of your drive / partition letters and then reboot your computer. In case, if above method fails to fix the corrupted recycle bin, then use sfc /scannow instead of rd /s /q C: \$Recycle.bin code in Command Prompt. Now, Recycle Bin will be reset and you can access the files in your Recycle bin. However, in this process some of your files from Recycle bin may get erased. No worries, use Remo Recover Software to get back all your files. It will even restore pictures from Recycle Bin with other generic & media files. It is better to act before you lose your important data.